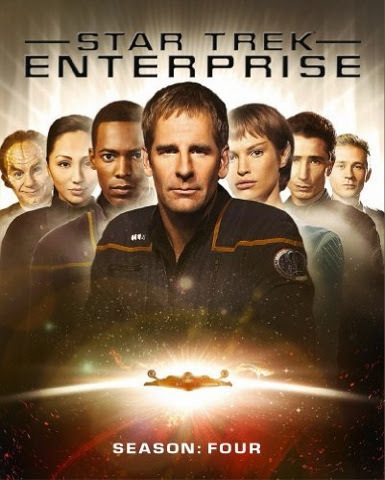 The fourth season of Star Trek: Enterprise was in my opinion the best of the entire series. It usually takes two or three seasons for a drama to really come into it's own and then it either keeps getting better or has an up and down swing. Some shows start so good that after the first season, due to circumstances partially out of the show's production team and network's control, the program is never able to capture that magic it had again. Enterprise, now officially known for all four seasons as Star Trek: Enterprise was different. While the first two seasons have some good episodes, those seasons just were not as interesting as the third season with it's year long Xindi story arc and then Manny Cotto stepped in at season four into the seat previously belonging to Brannon Braga and he made the fourth season the best season because besides being a fan of Star Trek himself, he remained as true as possible to the cannon and even bought on Star Trek novelists into the writing staff. Then he tried to resolve issues between Star Trek: Enterprise and Star Trek: The Original Series and if the show had not ended it's run just before merger between UPN and TheWB that formed TheCW, I think Star Trek: Enterprise could have gone down as one of the best Star Trek series produced because Manny Cotto had more story ideas related to the original series and wanted to do the Earth Romulan War in the next season and eventually show how the Federation was formed afterwards. He also had another story idea set in the mirror universe and there had been talks for William Shatner to appear in an episode related to the mirror universe that never came to fruition. Unfortunately an additional three seasons simply were not going to happen so they drew the series to a close knowing this as best as possible. As it is, I think many fans of the series would agree that Enterprise definitely ended as a better television show than it started. After resolving the cliffhanger and the Temporal Cold War storyline that had run through previous seasons, Enterprise focused itself on several multipart episode mini story arcs that tie up and answer questions so beautifully that it not only jells well with what we have come to know in Star Trek: The Original Series, but it also paid off on questions and elusive answers that go through to both Star Trek: The Next Generation and Deep Space Nine. Among the story arcs are one regarding a group of augments or genetically enhanced humans that easily commandeer a Klingon Bird of Prey and set about freeing the human descendent of Dr. Noonian Soong, who believes that with the correct genetic manipulation and behavior, Augments could rise above their unstable and aggressive nature. Brent Spiner guest starred to play the man whose work ultimately has ramifications for many things to come, including starting the research that two hundred years down the line will not only lead to the creation of Mr. Data, but even on Deep Space Nine, Augments not only prove useful in assisting the Federation in the Dominion War, but we learn that Doctor Bashir is in fact an Augment in his own right, but he displays none of the psychosis inherent within early twenty fourth, twenty third and twenty second century eugenics creations encountered in various incarnations of Star Trek. In fact one could say that Manny Coto's work and guidance of the other writers that were on staff during the production of the fourth season of Star Trek: Enterprise gave the Bashir revelation on Deep Space Nine more of a payoff since he is perhaps the closest to genetically enhanced human that Soong had set out to bring forth. The augment story arc leads to another story arc that ultimately explains why the Klingons of The Original Series look different from their counterparts before and after and even adds an extra but of already existent comedic punch as well as a greater understanding as to why when Mr. Worf is asked why the Klingons of Kirk's era look different, Worf simply replies something along the lines of "We don't speak of it" in the Star Trek: Deep Space Nine episode "Trials And Tribble-ations." Other story arcs reveal why the Vulcans of Enterprise behave differently than the Vulcans of the other shows, events that prelude the Earth Romulan War and ultimately lead to a union of four galactic governments that eventually leads to the foundation of the United Federation of Planets. There are also story arcs exploring the mirror universe as well as an anti alien movement threat that features Section 31, which handles covert operations within Star Fleet and was originally introduced in Star Trek: Deep Space Nine. Some episodes are actually connected to episodes of Star Trek: The Original Series and The Next Generation showing things going on at the same time those episodes are supposed to take place. Among the guest stars besides Brent Spiner are Alec Newman, Peter Weller, Peter Mensah, Jonathan Frakes, Mirina Sirtis and WWE Wrestler, The Big Show. All twenty two season four episodes of Star Trek: Enterprise are presented across six discs in their 1080p/24fps (1.78:1) widescreen aspect ratio, the way they were meant to be seen. Some matte effects don't hold up after a decade, but Enterprise remains the best looking Star Trek TV series on Blu-ray Disc because it was shot in high definition video. A vibrant English DTS-HD MA 5.1 Surround Soundtrack is provided for all twenty two episodes too along with a German Language Dubbed Dolby Digital 5.1 Surround Soundtrack and French and Japanese Language Stereo Surround Dubbed Soundtrack options. English Subtitles for the Deaf and Hearing Impaired and French, German, Japanese and Dutch Language Subtitles are encoded as options across all six Blu-ray Discs. New features exclusive to this Blu-ray set include new episode length audio commentaries on six episodes as well as two audio commentaries and three text commentaries carried over from the original DVD set. Before Her Time: Decommissioning Enterprise is a brand new four part feature length documentary covering Manny Cotto's approach to the fourth season in "New Voices" (26:49), Memorable Voyages (28:42), the series ending, which concluded 18 years of first run Star Trek airing on broadcast television in "End Of An Era" (29:44) and the somewhat controversial approach toward the series finale, which was written by Brannon Braga and Rick Berman, which divided fan opinion and even left cast member Jolene Blalock still wondering whether or not anything on the show ever truly happened or was it all a holo program in "Final Approach" (30:05). A recently recorded interesting feature length discussion of the series entitled "In-Conversation - Deconstructing Enterprise" (1:29:52) with Brannon Braga, Mike Sussman, Andre Bormanis, David Goodman, Chris Black, Phyllis Strong, and Judith and Garfield Reeves-Stevens wraps up the new extras included within the six-disc set. The rest of the standard definition carry overs include deleted and extended scenes, mission logs, original editing and script gallery, visual effects magic, legacy links, Enterprise secrets, the series wrap, featurettes on alien characters created for the show, the set animals, outtakes, a photo gallery and ten NX-01 files. The interactive menus are all well rendered and easy to navigate. Approximately nine minutes of trailers for other Star Trek Blu-ray titles precede the main menu on disc one. Star Trek: Enterprise: Season Four on Blu-ray Disc is truly a stellar set to own and is available now at retailers on and offline courtesy of CBS Blu-ray and Paramount Home Entertainment.